This report is concerned with the prices of generic drug products in Canada, examining price trends in this country and comparing Canadian prices to those of other industrialized countries. The principal finding of this report is that generic drugs cost less in foreign markets than in Canada. These price differences are substantial. The implications of the international price comparisons are clear: mean or median foreign prices are, on average, only about two-thirds of corresponding Canadian prices. Bilateral comparisons lead to the same conclusion: of the 11 foreign markets considered in this analysis, there is no instance in which foreign prices are higher on average than Canadian prices. Analysis at the level of individual drugs and therapeutic classes indicates that foreign-to-Canadian price differentials are broadly based: foreign mean or median prices are substantially less than Canadian prices for the majority of drugs and nearly all therapeutic classes. 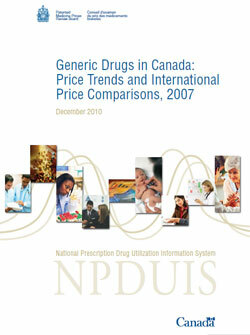 This report is concerned with the prices1 of generic drug products in Canada. This analysis specifically covers the sales of prescription drugs to pharmacies, examining price trends in this country and comparing Canadian prices to those in other industrialized nations. The analysis covers a set of 298 leading generic drugs.2 It is restricted to cases where there were at least two generic versions of the drug sold in Canada in 2007. Markets where there is a single generic supplier will be considered separately in a subsequent study. All data used in this report are from IMS Health's MIDAS database. Appendix C provides a detailed description of the process by which drugs and drug products were selected for inclusion in the analysis, as well as all other aspects of the methodology. A list of the drugs included in the analysis can be found in Appendix D.
The first row of Table 1.1 gives the total estimated Canadian ex-factory sales of the 298 generic drugs considered in this report. The second row gives the number of these drugs that were available as generics in the indicated year, while the third row gives the corresponding number of drug products that were available.3 Hence, Table 1.1 shows that in 2007, the 298 generic drugs covered in this study accounted for sales of $2,604.8 million, distributed among 1,486 drug products. Table 1.2 disaggregates sales of the leading generic drugs by major therapeutic class. Sales were heavily concentrated in two classes: Nervous System drugs ($940.5 million in 2007 generic sales) and Cardiovascular System drugs ($788 million in 2007 generic sales). While the set of 298 generic drugs considered here accounted for 17.4% of overall drug sales in 2007, the leading generics' share of sales at the level of major therapeutic class ranged from 1.1% (Respiratory System) to 31.8% (Nervous System). 1 Throughout this report the term “price” refers to invoiced prices reported by retailers net of estimated wholesale mark-ups. These prices do not reflect off-invoice discounts, free goods and other forms of price reduction such as rebates. Appendix C provides details on how prices are derived, as well as other aspects of the methodology. 2 Note that many of the markets considered in this analysis are “patented markets”, meaning (for purposes of this study) a market including at least one (branded or generic) product reported to the PMPRB as patented between 2003 and 2007. For the most part, the analysis draws no distinction between “patented markets” and “non-patented markets”. An exception occurs in Appendix B, which provides separate international price comparison statistics for these two sets of markets. 3 Note that the term ”drug” refers to a unique combination of ingredient, form and strength, while “product” refers to the (generic) version of a given drug sold by a particular supplier. See Appendix C for more on these and other key definitions used. Table 2.1 gives the average rate of year-over-year price change for the leading generic drug products covered in this study.4 For the sake of comparison, the table also lists rates of price change among patented drugs, as reported in recent editions of the PMPRB Annual Report. Generic prices declined at an annual average rate of -0.8% over the four-year period from 2004 to 2007. Patented drug prices rose at an annual rate of 0.2% over the same period. Table 2.2 reports on price trends by major therapeutic class. Each entry in the column labeled “Average price change (%)” gives the average annual rate of price change for the corresponding therapeutic class over the period 2006—2007. These rates have been calculated in the same fashion as the aggregate rate reported in Table 2.1, except that each calculation has been restricted to drugs in the indicated therapeutic class. The results in Table 2.2 indicate that overall price decline among generics was broadly based. Only the Respiratory System class produced an appreciable price increase of 4.1%. All other classes saw price decreases. Table 2.3 presents the range distribution, providing more detail on the price changes underlying the averages reported in Table 2.1. In this table, drugs are divided according to their rate of price change from 2006 to 2007. Hence, the first row in Table 2.3 shows that the prices of generic products in 18 markets (6.4% of all markets) fell by more than 10% between 2006 and 2007. These drugs accounted for sales of $116.5 million (4.5% of all generic sales) in 2007. The results in Table 2.3 indicate that price declines were widespread. The prices of 219 drugs (77.4%), accounting for $2,211.7 (86.0%) of the generic sales, fell between 2006 and 2007. Where prices rose, the increase was typically less than the annual rate of CPI-inflation of 2.2%. In fact, there were only 12 markets where the price of generic products rose by more than 1%. Results at the extremes of the range distribution presented in Table 2.3 indicate a number of cases where prices rose or fell markedly. Table 2.4 identifies individual generic drugs whose prices rose or fell by more than 10% between 2006 and 2007. 4 See Subsection 6.1 of Appendix C for a description of the price index methodology applied here. Bilateral foreign-to-Canadian price comparisons are presented here using the following countries as comparators: Australia, France, Germany, Italy, the Netherlands, New Zealand, Spain, Sweden, Switzerland, the United Kingdom and the United States. Multilateral foreign-to-Canadian price comparisons are also presented using the following indicators as comparators: minimum foreign price, maximum foreign price, the simple mean of foreign prices, the weighted mean of foreign prices (with weights based on sales by country) and the median of foreign prices. Each of these indicators is an aggregate measure encompassing all countries for which a price can be calculated. The results in Table 3.1 indicate that foreign generic prices are typically less than corresponding Canadian prices. Average prices ratios range from 0.95 for Australia to only 0.19 for New Zealand. However, even in the cases where coverage is greatest — France, Germany, the Netherlands, the UK and the US — foreign prices appear, on average, to be 20—40% less than Canadian prices. Coverage is greatest for the US, where the average US-to-Canadian price ratio is 0.47. Table 3.2 provides average foreign-to-Canadian price ratios based on the multilateral measures of foreign price previously described. The table contains two sets of results. The first set (labeled “PMPRB comparator countries”) was obtained using multilateral price measures encompassing only the PMPRB's seven comparator countries. The second set (labeled “All countries”) is based on multilateral price measures encompassing all 11 foreign countries represented in Table 3.1. The results in Table 3.2 and Figure 3.2 confirm that foreign generic prices are typically less than corresponding Canadian prices. Only maximum foreign prices are, on average, greater than Canadian prices. Average price ratios obtained using multilateral measures of central tendency (i.e., mean, weighted mean, median) as the comparator price indicate that foreign prices are 35—48% less than Canadian prices. Table 3.3 provides more detail on the individual price ratios underlying the average ratio of median foreign-to-Canadian prices reported in Table 3.2 for the “All countries” case. It divides the 268 drugs according to the extent that the median foreign price differs from the Canadian price. Hence, the first row of Table 3.3 indicates that in 26 cases (9.7%), the median foreign price was less than 25% of the corresponding Canadian price, with these drugs accounting for $161.4 million (6.9%) of sales. The results in Table 3.3 confirm that median foreign prices are typically less than corresponding Canadian prices. For 177 drugs (66.0%), the median foreign price was less than 75% of the Canadian price, with these drugs accounting for $1,747 million (74.6%) of sales. In contrast, there were only 36 instances (13.4%) where the median foreign price exceeded the Canadian price by at least 25%. Table 3.4 provides average foreign-to-Canadian price ratios by therapeutic class. These average price ratios have been calculated in the same fashion as the multilateral foreign-to-Canadian “All countries” average price ratios reported in Table 3.2, except that each calculation has been restricted to drugs in the indicated therapeutic class. The number of drugs and associated 2007 Canadian generic sales covered by each ratio are also provided. The results in Table 3.4 confirm that the tendency of Canadian prices to exceed foreign prices is broadly based. Concentrating again on measures of central tendency, only in the cases of Systemic Hormonal Preparations and Antiparasitics — each very small in relation to total generic sales — are the mean and median foreign prices higher, on average, than Canadian prices. Results for all other therapeutic classes indicate that foreign prices are below, and frequently substantially below, Canadian prices. The two leading therapeutic classes by sales, Nervous System and Cardiovascular System, are especially noteworthy. Depending on the multilateral measure, generic Nervous System drugs cost 20—34% less abroad than in Canada, while foreign prices of generic drugs in the Cardiovascular System class appear to be approximately half of corresponding Canadian prices. 5 See Appendix C for a detailed description of the methodology used to calculate average foreign-to-Canadian price ratios. 6 See, for example, PMPRB, 2009 Annual Report, Tables 13 and 14. 7 See Appendix C for further discussion of this issue. Note that, the method of currency conversion aside, the following tables and figures have been constructed in the same way as their counterparts in Section 3. Table 4.1 and Figure 4.1 give average bilateral foreign-to-Canadian price ratios ranging from 0.19 (New Zealand) to 0.90 (Australia). Note that the use of PPPs instead of market exchange rates moves the average US-to-Canadian price ratio somewhat closer to parity; this reflects the fact that by 2007, due to appreciation of the Canadian dollar, the Canada/US market exchange rate was appreciably less than the corresponding Canada/US PPP. Table 4.2 and Figure 4.2 present multilateral price comparisons obtained using PPPs. These results are very similar to those reported in Table 3.2. Here again, average price ratios obtained using the mean, weighted mean or median foreign prices all imply that foreign prices are, on average, substantially less than corresponding Canadian prices. Table 4.3 provides a range distribution constructed in the same fashion as Table 3.3. The results in Table 4.3 again imply that the median foreign prices of most generic drugs are substantially less than corresponding Canadian prices, with this median being less than 75% of the Canadian price for 176 drugs (65.7%). Table 4.4 provides foreign-to-Canadian price ratios by therapeutic class. The results in this table are much like those reported in Table 3.4. Here again, results obtained using the mean foreign, weighted mean foreign and median foreign price as comparators indicate that, with the exception of only two therapeutic classes, foreign prices are substantially less than corresponding Canadian prices at the level of individual therapeutic classes. This is again certainly the case for the two largest classes by generic sales, Nervous System and Cardiovascular System. 8 More exactly, the PPP between two countries represents the relative cost in the two countries of the same “basket” of goods; the cost in each instance is calculated at the prices prevailing in that country and expressed in its own currency. The principal finding of this report is that generic drugs typically cost less in foreign markets than in Canada. These price differences are substantial. The implications of the international price comparisons presented in Sections 3 and 4 of this study are clear: mean or median foreign prices are on average only about two-thirds as high as corresponding Canadian prices. Bilateral comparisons lead to the same conclusion: of the 11 foreign markets considered in this analysis, there is no instance where foreign prices are higher, on average, than Canadian prices. Analysis at the level of individual drugs and therapeutic classes indicates that foreign-to-Canadian price differentials are broadly based, with foreign mean or median prices substantially less than Canadian prices for the majority of drugs and nearly all therapeutic classes. Average foreign-to-Canadian price ratios reported in Sections 3 and 4 have been calculated as sales-weighted arithmetic means of individual price ratios. The PMPRB's Annual Report reports average foreign-to-Canadian price ratios calculated as sales-weighted geometric means of individual ratios, as well as those obtained as arithmetic means. This appendix provides alternative versions of Tables 3.1, 3.2, 4.1 and 4.2, with average international price ratios calculated as geometric means. This appendix provides separate international price comparison statistics for non-patented and patented drugs. For this purpose, a drug is identified as patented if at least one version of the drug (either branded or generic) was subject to price review by the PMPRB at some point over the period 2003—2007. If no version of the drug on the market over this period was reviewed by the PMPRB, it is considered non-patented. Tables B.1a and B.1b have the same format as Table 3.1 and provide bilateral international price comparisons for non-patented and patented drugs, respectively. Tables B.2a and B.2b have the same format as Table 3.2 and provide multilateral international price comparisons for non-patented and patented drugs, respectively. It is important to understand that the results presented in these tables still encompass only generic products. Hence, for example, the results presented in Table B.1a represent average ratios of foreign generic prices to Canadian generic prices for drugs that have been designated non-patented, as previously defined. Results obtained for non-patented and patented drugs both indicate that foreign prices of generic drug products are substantially less than corresponding Canadian prices. However, price differentials appear to be considerably larger in the case of patented drugs, with this pattern emerging in both bilateral and multilateral price ratios. The results described in this report have been calculated from a large set of data on drug sales and prices in Canada and other countries. This section describes the data, sources, concepts and methods applied in performing these calculations. In this report the term “drug” refers to any unique combination of active ingredient, strength and form. The term “product” refers to a version of a drug sold by a particular company. Results are sometimes reported by “major therapeutic class”. This refers to the Level 1 classes of the World Health Organization's Anatomical, Therapeutic, Chemical (ATC) drug classification system. Level 1 codes normally refer to the anatomical system on which the drug acts. A “branded” product is one sold under a particular trade name. A “generic” product is sold under the name of its principal ingredient. IMS Health's MIDAS database is the source of all price and sales data used in this analysis. MIDAS is a summary of data obtained from IMS Health's detailed audits of pharmaceutical purchases made by retailers (in 70 countries) and hospitals (in 45 countries). MIDAS contains information on sales of individual products, measured in both currency and physical units, as well as information on product manufacturer, active ingredient, brand, form, strength, pack size, and therapeutic class. MIDAS includes a field representing IMS Health's estimate of the sales revenue in local currency received by the company selling the product in question. This measure of sales is used throughout the analysis. IMS's estimates are based directly on the purchase information obtained in its pharmacy and hospital audits. To estimate the value of a company's sales of a particular product, IMS removes an estimate of wholesalers' mark-ups from the acquisition costs reported by pharmacies and hospitals. It is important to understand that the acquisition costs used by IMS are based on invoiced prices. Off-invoice discounts, free goods and other forms of price reduction such as rebates are, therefore, not represented in the MIDAS data. To the extent that such off-invoice reductions exist, prices derived from these data do not represent “money in the manufacturer's pocket”. Price data obtained from independent sources — most notably, provincial formularies — confirm that MIDAS's Canadian generic prices do reliably measure costs passed on to consumers and reimbursement programs by retailers. MIDAS provides a measure of physical quantity it calls “standardized units” (SU). This measure is used throughout the report. “Standardized units” represent IMS's estimate of the number of normal doses a given volume of physical units entails. This is simply the “number of pills” in the case of oral solids. A drug product's price for any given period is obtained by dividing the value of a manufacturer´s sales of that product by the number of standardized units of the product MIDAS reports for that period. For the purpose of this study, a drug is identified as patented if at least one version of the drug (either branded or generic) was subject to price review by the PMPRB at some point over the period 2003—2007. If no version of the drug was reviewed by the PMPRB over this period, it is considered non-patented. Every year the PMPRB, as an addendum to its Annual Report, publishes a list of patented drug products that were subject to price review as of the end of the calendar year. These lists were used to determine the patent status of individual drug products. A master list of leading generic drug products was constructed to perform the analysis of generic sales and prices. The following steps describe the method by which this was done. Step 2. Using information from Health Canada's Drug Product Database, any non-prescription drugs were eliminated from the list of drugs obtained in Step 1. Step 3. A list of all products corresponding to the drugs remaining after Step 2 was obtained. Note that the resulting list of products encompasses all branded and generic versions of the drug. Step 5. For each remaining drug, the number of generic versions on the Canadian market in 2007 was determined. If there was only a single generic version available in 2007, the drug was deleted. Matching products across countries is a difficult aspect of performing international price comparisons. Prices for the same drug can vary appreciably by strength, form and pack size, even within a single market. This suggests that price comparisons should be limited to those drugs where an exact match can be made. On the other hand, not all pack sizes may be available in all markets, which raises the possibility that a large amount of information may be lost if this is included among matching criteria. In the PMPRB's view, matching by drug (as defined above) strikes a reasonable compromise between rigour and coverage. This is the approach taken to produce the international price comparisons reported in the main text. All foreign-to-Canadian price comparisons are based on foreign prices encompassing foreign generic products only.14 Foreign generic products were identified by comparing the MIDAS Local Product Name and Molecule fields. As noted above, the MIDAS sales data used in this report are expressed in local currencies. Naturally, sales were restated in Canadian dollars to allow for meaningful international price comparisons. Currency conversions were done using (1) annual average spot-market exchange rates (as reported by the Bank of Canada)15 and (2) purchasing power parities (as reported by the OECD). The following subsections briefly describe the construction of the various statistics provided in the report. Price trends are examined using Laspeyres price indices, similar to those that the PMPRB presents in its Annual Report. This begins by designating “current” and “base” periods, as well as a relevant set of products. Quantities purchased in the base year are evaluated at the current year's prices, and the resulting hypothetical expenditures summed across all products. The resulting sum is then compared to the actual base-year expenditure to produce an average rate of change. Algebraically, the rate thus obtained is a sales-weighted average of individual drug-specific rates of change, with this average taken across drugs, and as such can be reasonably interpreted as an overall measure of price change. where signifies summation over drugs 1 to N.
The expression [pf(i)q(i)] represents the hypothetical amount of expenditure one would obtain by pricing out quantities at foreign prices (that is, what Canadians would have spent if they had paid foreign prices). The right-hand side of (3) thus represents the ratio of this hypothetical amount to the amount of expenditure obtained by pricing out quantities at Canadian prices (that is, what Canadians actually paid). where signifies multiplication over drugs 1 to N.
The arithmetic mean will always be a larger value than the corresponding geometric mean. The difference between these measures is governed by the extent of the variability among individual price ratios. The arithmetic mean will equal the geometric mean only in the special case where all individual price ratios are equal. 9 Retail pharmacy purchases account for more than 85% of drug sales in Canada, based on 2004 results from IMS's Hospital and Pharmacy Audit. 10 Note that, under this approach, a drug's price can be interpreted as a sales-weighted average of the product prices it encompasses. 11 To facilitate computation, the analysis was also limited to drugs with a single active ingredient. 12 For a large majority of generic products, the ingredient name actually appears in MIDAS's brand-name field (along with a company identifier). Sometimes the brand-name field contains the ingredient name in a modified form, in which case the product was retained as a generic. Only products sold under names clearly different from that of their principal ingredient were eliminated. 13 Note that whether the product is sold by a “generic” or a “brand-name” manufacturer does not matter here. This means the list of generic products produced at this step will include so-called “pseudo-generics”, generic products sold by companies principally engaged in selling branded products. 14 Because generic versions of some drugs are not available in all markets, the number of matches will vary from comparator to comparator. 15 This is the Bank of Canada's annual average of the daily noon rates.